In the final section of the sterile injectable drugs market report, ‘Competitive Landscape' section is included to provide a detailed analysis with a dashboard view, to access the key differentiators among the competitor firms. Detailed profiles of major manufacturing companies is included with company-specific long-term and short-term strategies, company profiles are equipped with their product offerings and recent developments in the sterile injectable drugs market. This section can give the reader an idea of the new strategies that he/she can devise and implement with a view to gain competitive advantage. The intravenous administration of medicines into the body of a patient with a needle or catheter is prescribed by physicians and administered by trained professionals and nurses. It is used when oral medication is not effective for the treatment of diseases. It reduces the time spent by patients in hospitals, nursing homes and clinics. It includes continuous and slow administration of drugs, antibiotics, nutrients and other fluids into the veins on a daily, weekly, or monthly basis, depending on the patient’s condition. Sterile injectable drugs are sterile, parenteral preparations containing one more Active Pharmaceutical Ingredient (API) intended for administration into the body. These preparations are administered by injection, infusion or implantation in the body with help of needle, syringe or implantable devices. Sterile injectable drugs market is highly regulated with rigid guidelines owing to safety, quality and sterility requirements. Drugs and biological preparations which are available in sterile, injectable form are considered for this study. Sterile injectable drugs is an effective and safe alternative against conventional hospitalization for treatment of diseases as it provides a faster recovery from diseases. Sterile injectable drugs is employed in the treatment of diseases which are unresponsive to oral medication, such as cancer, cardiovascular diseases, musculoskeletal, diabetes and other diseases. It is also recommended in the treatment of diabetes and other infections. Sterile injectable drugs improves medication adherence and reduces unplanned hospitalization. The global sterile injectable drugs estimated to be worth US$ 383.1 Mn by 2017 end and is expected to expand at a CAGR of 6.9% over the forecast period of 2017–2025. The global market for sterile injectable drugs has been witnessing an upward growth. In 2017, it reflected a valuation of more than US$ 380 Mn and is anticipated to touch a value higher than US$ 650 Mn by the end of the year of assessment. Growth of the global sterile injectable drugs is primarily driven by increasing demand for novel drug delivery systems, rising prevalence of chronic diseases, increasing public private partnerships and also rising awareness towards the use of sterile injectable drugs. The rising demand for injectable drug delivery is driving injectable drugs development and growth of sterile injectable drugs in health management associations. However, high operational costs, discontinuation of products, monopoly in manufacturing & sourcing, lack of standard usage guidelines & trained manpower and lack of proper treatment/diagnosis options for diseases are some of the factors expected to hamper the growth of the global sterile injectable drugs market over the forecast period. The cardiovascular diseases segment is projected to grow at a higher rate throughout the period of assessment. It is expected to register a CAGR of 9.2% during the 2017-2025 timeline and is estimated to touch a valuation more than US$ 100 Mn by the end of the year of assessment. 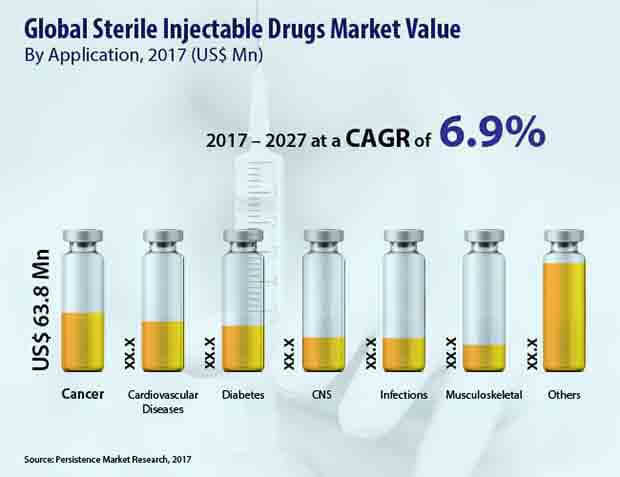 Cardiovascular diseases segment along with the Cancer, Diabetes segments is expected to present better investment opportunities for prospect investors in sterile injectable drugs market. The others application segment held a highest revenue share of approximately 31% in 2016 and is expected to dominate throughout the forecast period, registering higher CAGR as compared to other segments.